If one were to witness a performance from Julianna Barwick anywhere else but a church, would the emotional response to her music be the same? 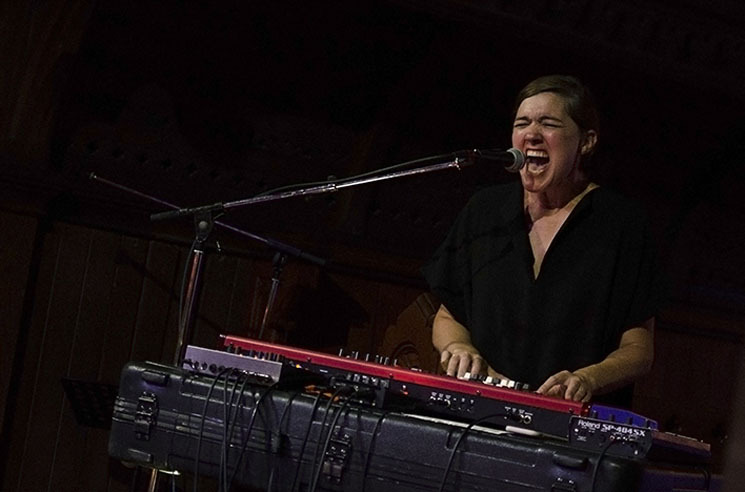 With some having likened her sounds to modern day hymnal music, St. Alban's Anglican Church was the perfect setting in which to experience Barwick's masterful display of vocal looping and layering. Standing at her keyboard and pedals beyond the reach of the dim church lights, Barwick's voice resonated throughout the room amidst her swelling soundscapes. Showcasing her extensive vocal range by harmonizing with herself, the soaring highs and restrained lows were joined together in expert fashion through her technology. In preserving the appealing organic nature of her work, Barwick's approach to vocal looping was the exact opposite of the static, calculated process one might imagine, with each layer falling into one another in a sublime, natural fashion. Effectively holding all their applause until the very end of the performance, the audience sat in awestruck silence as she gently segued from one song into the next.